I could write superlatives about how much I love sneakers, but I think it’s safe to say you know just how much I love / wear them on a weekly basis. Here’s how you can pull off the “sneaker with everything” look. I spend 60% of my day worrying about what sneakers I should wear, and the other 40% looking up new sneakers. Most of the time it ends in not adding them to cart, because even I, of all people know I only have two feet and owning too many pairs of sneakers is indeed wasteful. I have actually culled my collection in the past few days. I have sold and donated ones that I haven’t worn. I have a rule of if they still look brand new and I haven’t worn them in 6 months, they need to go. 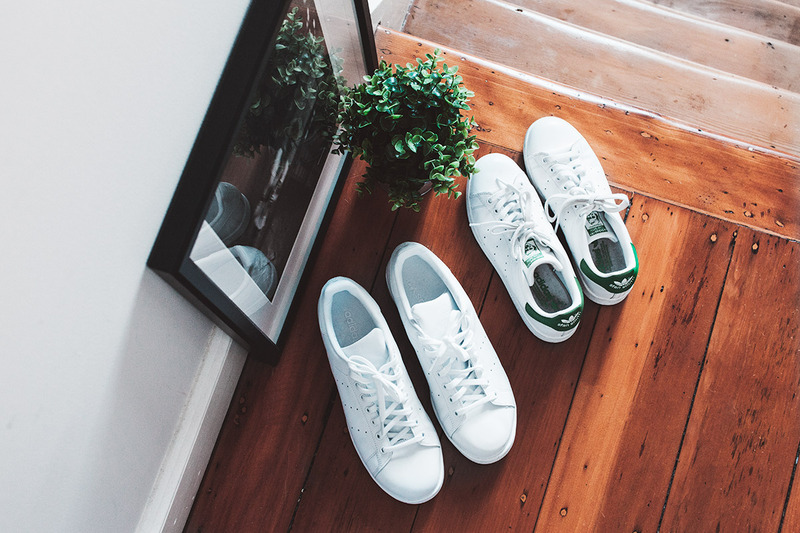 My favourite at the moment are my Arigato high tops, classic adidas Stan Smiths and the velcro adidas Stan Smith X Hyke that I have in both navy and white. They were just too good not to get both colours. Sometimes my indecisiveness is paralyzing. JD also loves sneakers, so it’s great to be married to someone that understands my obsessive nature. 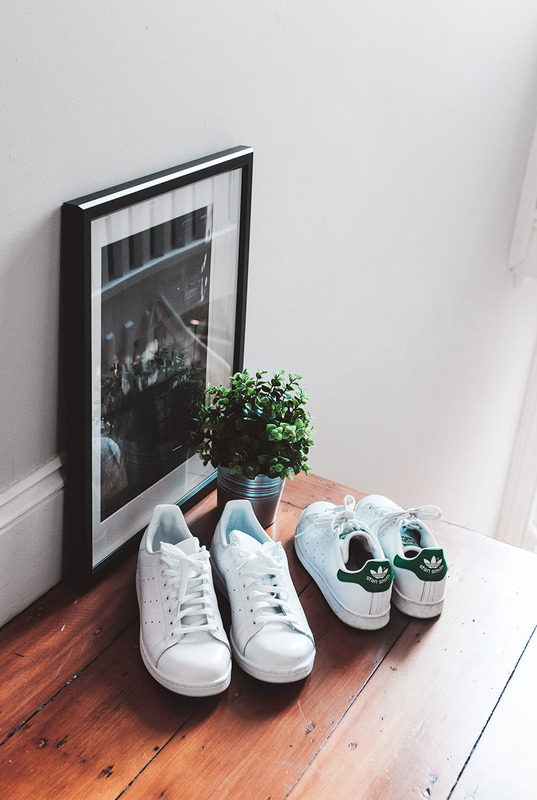 This may surprise you if you haven’t delved into this arena just yet, but sneakers look incredible with tailored pieces. Think suit pants, blazers and structured dresses. The juxtaposition between formal and relaxed makes it work. One of my favourite ways to wear skirts is with sneakers, otherwise I feel far to feminine. Add in an oversized t-shirt or jumper and a leather jacket, trench or blazer and you’re good to go. Well this goes without saying, so I’ll keep with brief because you’re a savvy bunch and I know you will know how to style sneakers casually. After all, you’ve probably been doing this since High School. When you break it down, the through of pairing a beautiful lace dress or silk slip with sneakers seems like it would be a huge regrettable sartorial moment. The thing is, it just works. If you’re wanting to give this a go uplift your outfit by simply pairing it with statement accessories, killer sunglasses if you’re wearing this look during the day and white sneakers. Nothing beats this look. Nothing! One of my favourite Winter looks is an over-sized trench and sneakers – it is the perfect mix of tailoring and tomboy and a look that is at no risk of dating.